18” eave and gable overhangs. One of the many benefits you receive when PermaBilt® builds your building is we have our own crew do the work as opposed to others who use subcontractors. This important factor was a key selling point when this couple in Marblemount Washington had us build their 2 car garage and shop. In an initial meeting with our PermaBilt® Building Representative, our clients stressed they wanted their garage and shop building to closely match their existing structure (pictured in the foreground) as far as color and styling. It would appear we nailed that desire! 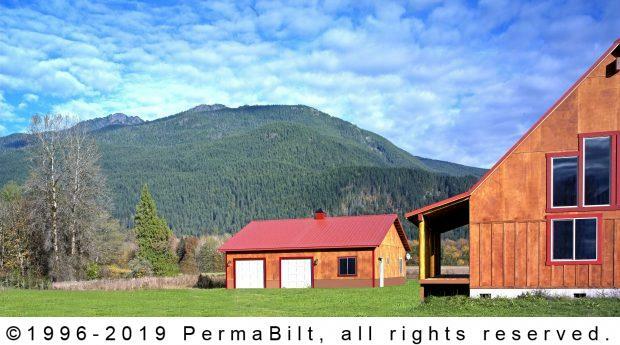 With pre-construction details in hand (including the necessary permits), PermaBilt® was ready to construct their garage and shop to their desired specifications. Although the picture doesn’t do it justice, this is a good sized building at 36’ x 36’ 10’. On top of the roof is a cupola an d weather vane. A cupola is not for show! It is a pleasing design, fully functional roof vent. We can understand if people in Marblemount were to refer to their community as ”God’s Country”. It’s a beautiful area and we were proud to assist in building a wonderful garage and workshop for this delighted client.